Claws out! Kyle Richards’ feud with Lisa Vanderpump has sunken to junior high school level as their #puppygate fight heats up. On Thursday night, Kyle Richards and friends mocked Lisa Vanderpump’s husband, Ken Todd, during a night out in Hollywood. As fans know, Kyle and Lisa had an explosive showdown during last Tuesday’s episode of the Real Housewives of Beverly Hills after Kyle accused Lisa of planting a damaging story in the press about Dorit Kemsley. Lisa’s husband, Ken Todd, screamed “Goodbye Kyle” before kicking Kyle out of Villa Rosa. 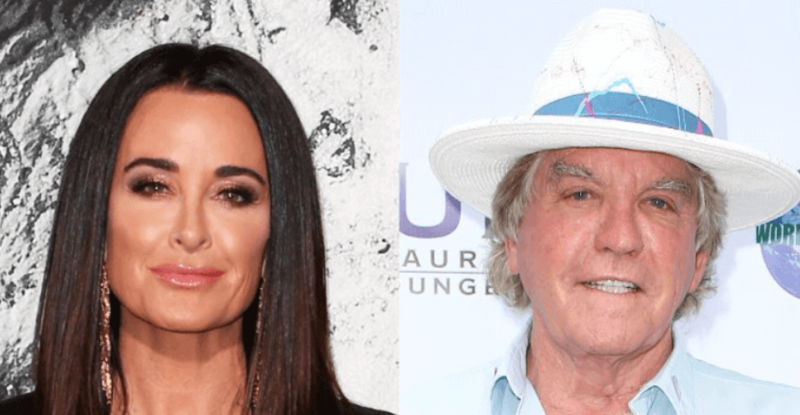 Teddi Mellencamp Implies Lisa Vanderpump Is Shady & Lied About Dorit Kemsley’s Dog Drama! Her friends encouraged the childish display by joining her “Goodbye Kyle” rant and even the Uber driver got in on the action by shouting each passengers name as they exited the vehicle. Note the English accents used to imitate Ken. Press play to watch below. Then in what seems to be a coordinated effort, Kyle Richards’ co-stars, Erika Girardi and Lisa Rinna also posted their own “Goodbye Kyle” videos. Watch below. View more videos below of Dorit Kemsley also joining the mocking “Goodbye Kyle” brigade. Press play below. Share your thoughts on Kyle Richards and her friends mocking Lisa Vanderpump’s husband. The Real Housewives of Beverly Hills airs Tuesdays, 9 p.m. on Bravo. Lucy Lucy Apple Juice Suffered Extreme Trauma In the Care of Dorit Kemsley — Dog’s New Owner Speaks Out Amid PuppyGate Scandal! Dorit Kemsley Says She Felt “Stabbed in the Heart 10 Times” By Lisa Vanderpump Over Puppy Gate Article!